SFCC and the TRiO Student Support Services Program hosted the annual TRiO Day celebration on Feb. 9 with more than 150 TRiO participants attending from throughout the state. The day began with Director of Student Recruitment & Outreach Marcos Maez, Student Admissions counselor Daniela Gurule, Center for Diversity and Integrative Learning Coordinator Emily Stern and Student Recruiter Fei Xu leading the attendees on a short tour of campus. Cecilia Y.M. 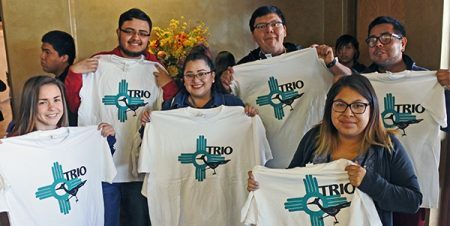 Cervantes, Ph.D., interim SFCC president and Dawn Blue Sky-Hill, president for TRiO New Mexico and director for the TRiO Student Support Services program at the University of New Mexico welcomed the students. Emily Stern of CDIL led an activity that was a collaboration with UNM staff, SFCC Fine Arts faculty member, John Boyce, and CDIL. The activity was interactive and focused on students’ cultural strengths, the benefits of TRiO programs, and the ways in which TRiO programs sustain the futures of their participants. The result of the collaboration was a TRiO sculpture, which was taken to the Roundhouse in the afternoon, where TRiO staff and students provided testimonials to increase awareness and rally support from state legislators for TRiO programs. For more information about SFCC’s TRiO program read here.